PUNO, Peru, Sep 4 2010 (IPS) - Seen from up high, the route to Puente Inambari looks like a green serpent — long, robust and sinuous. The Amazon jungle that dominates this landscape will be underwater if one of the largest hydroelectric dams in Peru (and all Latin America) is built. At Puente Inambari, the regions of Puno, Cuzco and Madre de Dios converge, in southeast Peru. Some 70 villages in these regions would have to be relocated if the Peruvian government approves the definitive concession to EGASUR (Southern Amazon Electrical Generation Company), based on Brazilian capital, to build a hydroelectric plant and create a reservoir covering 37,800 hectares, according to the company’s feasibility study. Thirty-two towns in Puno, 28 in Cuzco and 10 in Madre de Dios would be displaced by the Inambari project, located between the Amazon jungle plain and the Andes mountains covered by cloud forest that extends into the buffer zone of the Bajuaja-Sonene National Park, rich in plant and animal wildlife. That calculation is part of an investigation by engineer Rosario Linares, of Civil Society for the Construction of the Puno Trans-Oceanic Highway, who says in that region alone the project would affect 10,000 people. EGASUR maintains that the totals are lower. Inambari is one of the five hydroelectric dams planned as part of the accord signed Jun. 16 by Peru and Brazil for the generation of 6,000 megawatts of electricity. On Aug. 24, Peruvian President Alan García presented an energy and irrigation proposal, to be sourced at the Marañón River, to Brazilian business leaders. Environmental groups here insist that the project will overwhelmingly benefit Brazil, because Peru has to turn over an undetermined portion of energy to its neighbour for the next 30 years and will not be able to increase its participation even if it needs the energy to supply domestic demand. Most of the local residents oppose the project, but a small sector has agreed to dialogue with the company. However, both groups agree that the environmental impact study is a “superficial effort,” based on the initial findings presented in information workshops. File 21160308, with more than 300 pages, at the Energy Ministry’s electrical concessions office, reveals the plan’s rapid advances. On the ground, in Puerto Manoa, one of the first towns in Puno slated for relocation, graffiti seems to shout “No to the Inambari project!” Signs on houses, most made of wood planks with zinc roofs, make the residents’ opposition clear. “They will hurt the forests and there will be no more oxygen. But the company only talks about benefits. People are worried,” resident Lucy Chuquimamani, 28, told Tierramérica. Distrust of those coming from outside is evident in the wary looks on the faces that peer out windows. In Puerto Manoa, EGASUR held just one of the two planned presentations, with many gaps in the information, say residents. Tierramérica tried 10 times, unsuccessfully, over the course of a week to obtain a response from the firm’s community relations manager, Mauricio Millones. EGASUR, a consortium of the private OAS group and the Brazilian government’s Eletrobras Furnas, requested a temporary concession in May 2008, which was granted until April 2010. When the time expired, the company requested an extension until October 2010, with the intention of obtaining a definitive concession. Now it is trying to extend the period to June 2011 because it has not yet obtained a social impact permit to begin work. The projected investment is approximately 5 billion dollars, for an installed capacity of 2,200 megawatts, according to a preliminary version of the feasibility study. At the EGASUR office in Mazuco, capital of the Inambari district in Madre de Dios, community relations staff informed Tierramérica that the indigenous community of San Lorenzo, located on the border between this department and Cuzco, supports the project. But the president of the San Lorenzo community, Alejandro Ríos, refuted that statement. “If the hydroelectric dam is built, those animals are going to die. We want to know how EGASUR is going to remedy this,” he said. Biologist Ernesto Ráez, director of the Cayetano Heredia University’s environmental sustainability centre, warns that projects of this magnitude have a “domino effect” in the Amazon, because they disrupt hydro-biological cycles, as indicated in the report “Dams and Development,” published in 2000 by the World Commission on Dams. 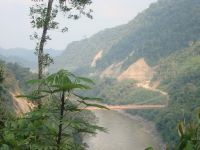 By stopping the river flow, sediment accumulates at the bottom of the reservoir, reducing the transfer of organic material necessary for the formation of river beaches and new forests downriver. With the dam, local biodiversity will depend on water flows associated with energy demand, not on the natural seasonal cycle, which is so important, Ráez told Tierramérica. During the periods of higher water — rainy season — the rivers move sediment from the forests that enriches the soils downriver and provides food for fishes, while during the dry season, turtles lay their eggs on the beaches. If these circumstances no longer occur, species reproduction likely will decline. In the rivers of the Amazon there are more than 10 species of migratory catfish, which represent 90 percent of the fish consumed by the local population, the biologist said. “Environmental management should take into account the entire watershed, because the zone around the reservoir is not the only area affected,” he said. Furthermore, decomposition of the organic material trapped by the dam will release great volumes of methane, a gas whose greenhouse effect is 23 times greater than carbon dioxide per unit. And the area already has its environmental problems: EGASUR itself and some officials have pointed to the contamination caused by informal mining in the Inambari area.